Q1. How seq command works? Q2. How to add a separator? Q3. How to specify output format? 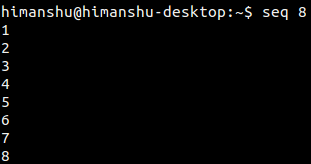 Sometimes, you come across a command line tool that offers limited functionality on its own, but when used with other tools, you realize its actual potential. Once such tool is seq, which prints a sequence of numbers. In this tutorial, we will discuss the basics of this command line utility using easy to understand examples. But before jumping on to that, it's worth mentioning that all examples in this article have been tested on an Ubuntu 16.04 machine. defaults to 1 even when LAST is smaller than FIRST. is greater than LAST. FORMAT must be suitable for printing  one  argu? Following are some Q&A-styled examples that should give you a better idea on how the seq command works. Basic usage is very easy. All you have to do is to pass a number to seq, and the tool will producein output numbers from 1 to the input number. Of course, you can also specify the number from which you want the output to begin with. If you want, you can also have a separator to make the seq output look better. This feature is available through the -s command line option. precision consisting of a `.' followed by zero or more digits. Suppose you want to create a bunch of new files with names where only an integer value changes. For example, file1, file2, file3, and so on. Here's how you can do this using seq. So now you'll agree how useful the seq command is. If you talk about the command line options Seq offers, there's not much of a learning curve, just that you should know when and how to use the command and its options. We've covered several use cases here - should be enough to get you started with the tool. 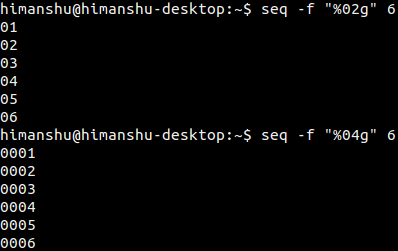 For more information on Seq, head to its man page. "Suppose you want to perform addition of some numbers, say from 1 to 10." should be "from 111 to 121". in my shell creates "111 + 112 + 113 + 114 + 115 + 116 + 117 + 118 + 119 + 120 + 121 +"